Ancient mystical wins are far better than usual when you play with Druidess Gold slots. Enjoy the magical bonuses and unique features of this priestly game! 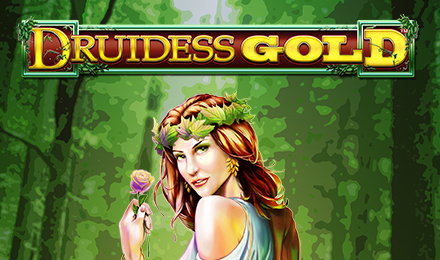 Allow yourself to be transported to the ancient forests of the magical druids in this celctic inspired slots game. Take advantage of the amazing Reelfecta Reel which allows you to rack up more wins by giving you aditional special symbols after it takes away the winning ones. Look out for the Druidess, Burning Candle, Full Moon, Sorcerer, Sword and Staff, and the Druidess Bonus Logo. This logo brings you to the Ring of Protection Bonus where you'll be awarded three free spins and have either a Wild or Poison Potion revealed to you-- delivering you aditional free spins or 2x your total bet! Start playing now!